January 10, 2017 January 11, 2017 Katrina RyderInside Out, You Go, Girl! Dry your eyes and pull yourself together! Be logical. Mind over matter. Don’t be overcome by your feelings. Make a decision from a list of all the pros and cons; your feelings will change. Have you heard any of the above? How do those statements make you feel? Maybe it is just me that hears statements like this quite often, but I’m tired of it. I’m tired of feelings and emotions being presented as inferior to logic and reason. I’m tired of the inference that feelings and emotions are unsafe, foolish, or weak. Whether you are a highly feelings driven person or not, the truth is, emotions aren’t bad. I grew up in a very loving and supportive home, but as a very emotional teenager, I was often teased for my moodiness and my inconsistent feelings. I guess I really took this to heart because by the time I got to college, I was working really hard at NOT being emotional. I really wanted to be stoic, grounded, and logical. I doubt I succeeded even the smallest bit at conveying this, but one consequence of this effort was that I became involved in a VERY serious long term relationship with someone who wasn’t right for me. In fact, we were engaged and almost got married. Truth be told, I had very ambiguous feelings throughout our relationship, but I was DETERMINED to be logical and, let me tell you, on paper, this guy was PERFECT. I kept ignoring my feelings (which of course I thought were fickle–ALL feelings are) and focused on the facts, which told me that we would be great together, nevermind my gut feeling. The answer to that led me back home, to meeting my future husband, and to a life that logically made no sense to me, but was comforting and soothing to me. You see. God made us emotional. God and Jesus are emotional. Scripture is actually full of stories that talk about God and Jesus displaying both positive and, gulp, negative emotions. And, here’s where you might really disagree. Negative emotions aren’t bad. Moreover, experiencing negative emotions isn’t sinful. Jesus wept. He got angry. He was overwhelmed. He rejoiced. He even got annoyed. 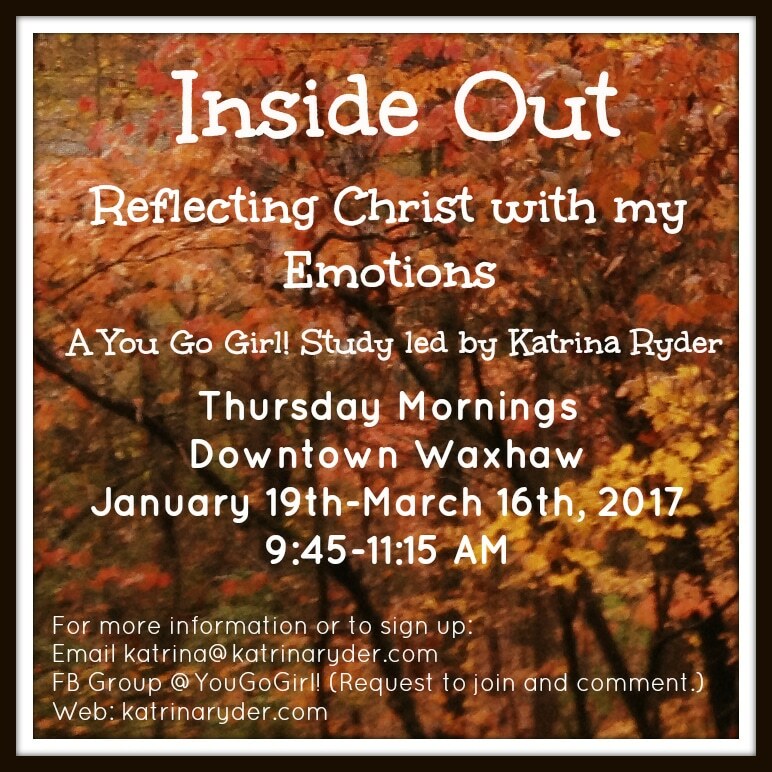 So how can we reflect Christ with our emotions, the good ones and the bad ones? This winter, I’m going to be leading an 9 week study on this topic at my home in downtown Waxhaw, Thursdays 9:45-11:00. (I’ll send my address to those who sign up.) 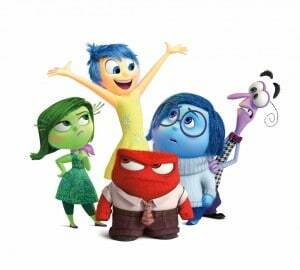 Based on the emotions featured in the movie Inside Out, we will focus on Joy, Sadness, Fear, Anger, and Disgust–among others. Our main Scripture focus will be Jesus’ emotions during Holy Week, the week leading up to his crucifixion. Our final week will be a fellowship brunch with the childcare workers and children. PLEASE NOTE. There will be a small amount of required weekly reading and journaling for this study. Each week there will be 4 or 5 Scripture passages to read and a short reflection exercise. These can be done daily as a devotional or in a probably 1 hour session. If you decide to participate, whether online or with the live group, I am requesting that you hold yourself to a high standard of commitment. Group continuity is weakened by absenteeism and discussion suffers when some ladies aren’t prepared. As usual, I will be blogging (maybe vlogging) each week and posting links through the You Go Girl! Facebook group and the Inside Out Facebook Group. If you are interested in attending, here are the methods for signing up. Send an email to katrina@katrinaryder.com. Subscribe to these blog so that you will receive all the posts via email. Request to join the Inside Out Facebook group. Choose to receive notifications. CHILDCARE. Limited childcare is available at my mom’s house which is .25 miles from mine. Napping babies or lap infants can come to my house with their moms, but crawlers and walkers should go to childcare because my living room is quite small. If you would like childcare, let me know, and I’ll send you the form and a liability waiver.